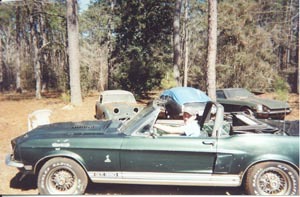 Early in 1968, a Highland Green convertible rolled down the FORD assembly line. It carried the serial number "8T03J165425". The car had a saddle interior. It was equipped with the 302 engine and a 4 speed transmission. 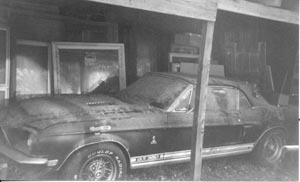 The car was sent to AO Smith for conversion to Shelby specifications. Shelby assigned the car suffix "2040". One day, on a break from training, a young Naval cadet named Oliver North spotted the car at a dealership and made a deal to purchase it. Yes, the same Oliver North on the FOX TV show, "War Stories" and FOX News. The same Oliver North that worked for president Ronald Reagan. North enjoyed the car for a while, but a growing family and gasoline crisis would convince him to trade the car in for a more practical station wagon. 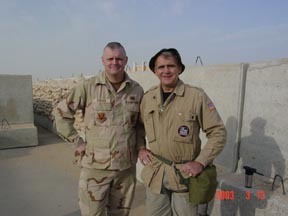 In February of 2003, I met Oliver North in Kuwait during Operation Iraqi Freedom. I had spoken to him several times and the subject of cars never came up. I guess we both had other things on our minds. My personal experiences with "Ollie" were wonderful. The man worked tirelessly. He routinely put in 18 hour days and still had time to talk to the troops. He was genuine. At my invitation, he came to visit the airmen in my unit. His visit was a great morale booster. It was so comforting to know there were people who understood what was happening and really cared. That was just two days before the invasion of Iraq. When Rick Kopec, the Shelby American Automobile Club director, heard about my new friend, he fired off an email. 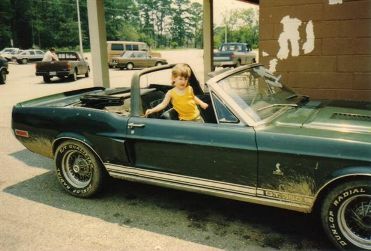 "Did you know Ollie once owned a GT350 convertible?" he asked. "Unbelievable" ... after all that time together and never a word about cars. The 1968 Registar, Vinny Liska, found the serial number and filled in the details. It was several weeks later, before I would catch up with North again and I think you can probably guess what the topic of discussion was....Ollie couldn't stop talking about his Shelby. "That car attracted my wife" said North. "I used to drive the wheels off that thing". "I wonder where it is now?" Sadly, I knew the car had not been seen for over 25 years. When I got home from Operation Iraqi Freedom, I updated the website. I posted a short message about Ollie and his car. He became the "featured" car on the home page. Then, I got an email from Chris Baldwin. "After looking at your website, I went out to the barn. The serial number on my GT350 matched the one you have posted. I was surprised. I almost sold the car last week" Chris added. "I have decided to keep the car for now"
Chris said he purchased the car from a doctor around 1977. The car now sported a custom green interior and the convertible top was a little tattered. 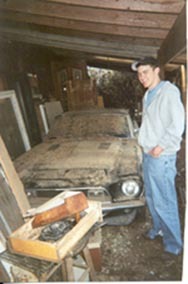 Chris drove the car for a while and when the car started having mechanical problems, he parked it next to his barn, under an overhang. ...and the car sat there for close to twenty five years. And a few weeks later I got another note from Chris. "My son, Chad (pictured) and I are enjoying the car. We even drove it yesterday, for the first time in nearly twenty five years. We had a ball." Just like Carroll Shelby wanted....drive it to the wheels come off. Chad enjoys the Shelby. Unfortunately, all of life's stories do not have happy endings. I was saddened to receive an email from Chris. Chris told me his son, Chad had passed away. Chad was one of the reasons the Shelby found new life. If not for Chad, the car would probably still be beside the barn. Chris has dedicated the car to Chad. After surviving years of neglect and Hurricane Katrina, #2040 is back. I have not seen Colonel North since our time together in Kuwait. I have forwarded him the information about his old car and I know he has received it.